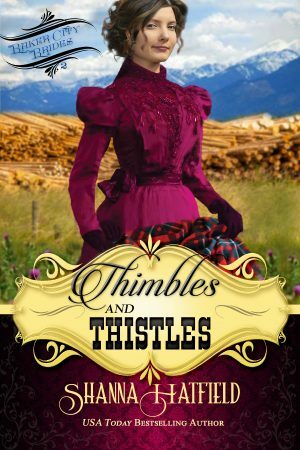 “Thimbles and Thistles holds so true to its subtitle; it is a sweet historical western romance. The Baker City Brides series just keeps getting better. While this is the second book, it can certainly be read as a stand alone and be enjoyed on its own merit. Maggie is the heroine of the story. Ian is the man she resists allowing into her heart. Thane and Jemma, as well as Sheriff Tully, are from Crumpets and Cowpies, book one, and are all dear friends of Maggie. The story takes place in Baker City, Oregon, a small western town where Maggie owns a dress shop and lives above the store. Ian is the owner of the lumber mill and has loved Maggie since he first saw her. Maggie lost her beloved husband Daniel in a mine accident ten years ago and has vowed never to fall in love and marry again. She is finding it harder and harder to resist the Scottish charm of Ian though. Thane, Jemma and Tully can see the love that flashes between Maggie and Ian, and each in their own way try to persuade the stubborn Maggie to allow herself to fall in love. We share mine accidents, bank robbers and more before we find out the big question: will Maggie marry Ian or spend the rest of her life alone? In the bright spring morning light, Maggie took note of the sunlight glinting off his hatless blond head. He wore his hair longer than she deemed proper and more often than not, it appeared tousled and wild, rather like the man himself. Broad shoulders looked like they could carry the weight of the world. Forearms corded with muscles drew her attention as he stopped the wagon beside her. The man’s Scottish brogue unsettled her, in particular when the letter “R” rolled off his tongue with a delightful burr. The hair on the back of her neck stood at attention, as if eagerly awaiting the sound of his voice, while her knees wobbled. His effect on her only infuriated her further. “Not that it is any of your concern, Mr. MacGregor, but I’m on my way to the Jordan Ranch.” Determined to ignore the way the corners of his sculpted mouth lifted into a smile, she narrowed her gaze and offered him a cool glare. She wondered what his face would look like without the abominable growth of scruff he sported. The fuzz on his face was just long enough to give him a rakish appearance and set all the twitterpated girls in town into a frenzy of whispers whenever he passed by. Fortunately, Maggie was long past the age of having her head turned by the considerable charms of a man like Ian McGregor.